The Observatory Town is a quite little town located southeast of Ardougne, and north of the Castle Wars Activity. The Main Feature here is the Observatory, but the Goblins destroyed the bridge to get there, so the only way there is via an Underground Maze. If you want to help the Observatory, you can do so during the Observatory Quest. You won't be able to fix the bridge though. An enchanted Emerald Ring becomes a Ring of Duelling, and allows 8 teleports either to Castle Wars, or to the Al Kharid Duel Arena. To get to the Observatory Town, teleport to Castle Wars and you will arrive in the Portal Hall of the Castle Wars building. Head out through the East door, then go North, and over two bridges. Once over the bridges, keep heading north to find the Observatory Town. If you have started Fairy Tale Part 2: Cure a Queen, and have obtained permission from The Godfather, you can use the Fairy Rings to get to the Observatory Town. With a Dramen or Lunar Staff equipped, head to to the main Fairy Ring in Zanaris (it's the one near the Fountains) and use the code BKP. 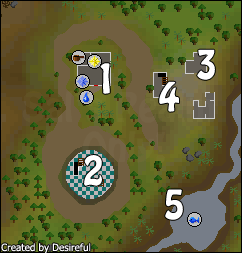 This will take you to the Chompy Hunting Swamp, south of Castle Wars. From here, head North and you should find yourself outside the Castle Wars building. From here, head north over two bridges. Once over the second bridge, keep heading north to find the Observatory Town. If you have completed Enlightened Journey, you will have access to the Hot Air Balloons. With 10 Yew Logs and a Tinderbox in your Inventory, head to Entrana and speak to Auguste. Tell him you want to go to Castle Wars, this will use up all of your Yew Logs. Once you arrive, you should find yourself outside the Castle Wars building. From here, head North over two bridges. Once over the bridges, keep heading north to find the Observatory Town. This is the Reception Room of the Observatory. In here, you will find the Observatory Assistant, sat at a Desk. You can talk to him, to start the Observatory Quest. 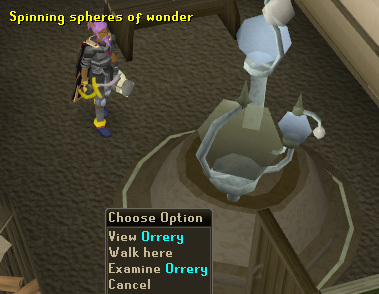 As well as a Quest start, you can find many other things in here, such as the Orrery. You can view the Orrery, but it doesn't do anything. It's more for decorative purposes. In the Western part of the Reception, you will find two books, which you can pick up and read. The red book is a 'Glassblowing Book', which teaches you all about crafting glass objects. 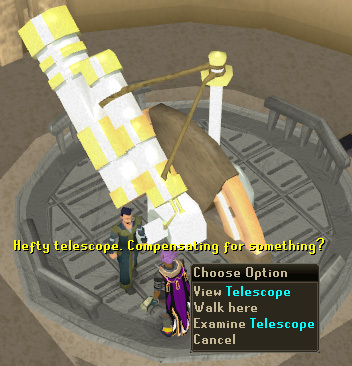 The other book is called the 'Astronomy Book', which talks about the History of Astronomy in RuneScape. In the Northwest corner of the Reception, you will find a Cooking Range, which can be rather helpful, if you are cooking food from the Fishing Spots in the corner of the Village. The last feature is outside by the Reception's Door, and that is a Well. You can use it to fill ordinary buckets with Water. If you manage to find your way through the Underground Maze, you'll find a ladder which takes you to the Observatory. The Observatory consists of two floors. On the Bottom Floor, there are several Star Charts on the walls which you can view. You will also find a stand for the Telescope, as well as a locked door which cannot be opened. On the Top Floor, you'll find the Observatory Professor, along with his telescope. You can look through the Telescope to find your Astrological Sign, which will determine what reward you will get from the Observatory Quest. If you are lucky enough to get a Co-ordinate Clue Scroll, (they give good rewards!) you will have to speak to the Professor to learn how to find the treasure/next clue. He will tell you that you need to calculate the position of the treasure, but you will need a Chart, Watch and a Sextant. He will give you the Chart, but you will have to find the Watch and Sextant yourself. You can obtain a Sextant by speaking to Murphy in Port Khazard. To obtain the Watch, speak to Brother Kojo in the Clock Tower near Ardougne. You can also make a Watch in the Workshop of a Player Owned House. After you have these three items, return to the Professor and he will teach you how to use the Sextant properly. The Goblin Settlement is made up of three buildings, one of which is the entrance to the Underground Maze. The other two buildings are different. The Northern building doesn't contain much apart from a few crates, which you can search. However, the Southern building is more special because it contains a respawn of Superantipoison (1). This potion is far better then your normal antipoison because it makes you immune to poison. In the middle of the Settlement you will find a Everlasting Fire, with two Goblins sat around it. Greasycheeks is cooking some food, while Smellytoes is drinking Beer and making himself very drunk. To the East of the Fire, is a Goblin called Creakyknees. He is trying to make another fire by reflecting light from a Lens onto some wood, he cannot seem to get it going though. By talking to him, you will learn that he stole the Lens from the Observatory. In the Eastern part of the Goblin Settlement, is an old, crumbling building. In this building is a staircase which leads you to an underground maze, which is mostly used in the Observatory Quest. The maze is inhabited by lots of Goblins (some of which can be killed). In the maze you can find lots of different things including a 'Kitchen' which is guarded by a Goblin Guard, who is level 42. Kill him and you will be able to gain access to the Kitchen, which has a use in the Observatory Quest. 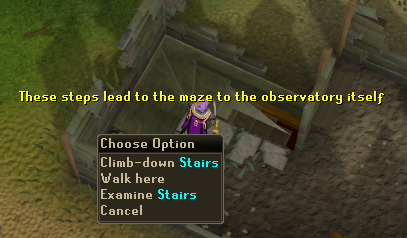 If you manage to find your way through the maze, you will find a ladder which leads you to the Observatory. In the Southeast corner of the village is a huge river, which contains lots of Fishing Spots, as well as Clothears the sleeping Goblin, who appears to be Fishing while sleeping. 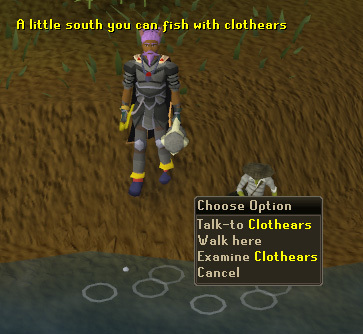 At the Fishing Spots you can either Lure or Bait. To Lure the Fish, you will need feathers, and a Fly-Fishing Rod. To Bait the Fish, you will need a normal Fishing Rod and some Fishing Bait, which can be brought from most Fishing Stores. 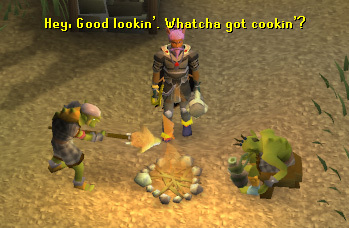 If you want to cook the fish as soon you catch it, you can either use the Range in the Observatory Reception, or the Everlasting Fire in the middle of the Goblin Settlement.